The media mavens, moguls and boldface names spotted today at Michael's. I was excited to sit down with longtime Democratic boosters Joan Gelman and Robert Zimmerman to get their take on the debate. 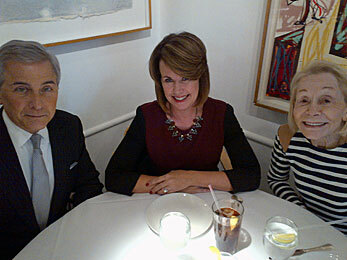 Both have successful, busy careers—Joan is a writer-producer who is currently working on a series of projects in Canada and Robert is co-founder and partner of Zimmerman/Edelson, a Long Island-based public relations/advertising firm specializing in national and international media relations, branding communications and crisis management. Yet he still somehow manages to devote an incredible amount of time and energy to volunteer on Democratic campaigns. “My focus is my firm, but I’ve always had a great passion for political activism and have been fortunate to have an advocacy role in the Democratic national agenda.” Robert will be traveling to Iowa and New Hampshire for the caucuses. Joan has hosted several Democratic fundraisers, most recently a swanky shindig in the Hamptons for Anna Throne-Holst, who, if elected, would be Suffolk County’s first ever congresswoman. Robert is a Democratic National Committeeman from New York and an in-demand political commentator who can be regularly seen on all the cable networks as a passionate and articulate (not to mention incredibly well-dressed) spokesperson for his party. Fresh off this morning’s appearance on MSNBC with Tamron Hall, Robert summed up last night’s debate this way: “It was a turning point for Hillary Clinton and the Democratic Party. [The candidates] demonstrated a great contrast to the Republican debate that looked like an infomercial for anger management therapy. Hillary certainly articulated a message and an agenda that expanded her base and showed presidential stature.” We all agreed she made the right call by eschewing the clichéd red power suit for I-mean-business-black. In addition to his spots on MSNBC and CNN, Robert will be sharing more of his insights during the campaign with regular appearances on Megyn Kelly‘s show on Fox News.